In the early 2000s, after building next-generation user interface systems at the MIT Media Lab and before founding my UI business, I had a brief stint as a science and technology ‘designer’ for a handful of big-budget films. Iron Man, Aeon Flux, and Ang Lee’s Hulk were all steep learning inclines, but the one that stands out as pure vertical (and ecstatic) ascent is also the earliest: Steven Spielberg’s Minority Report. Making a movie and running a commercial business are clearly distinct undertakings, but the latter can learn more from the former than is supposed. I’d like to let three interrelated ideas radiate from the experience of making (and watching) Minority Report. That day of extremely technical filmmaking cost at least $1m to prep and execute. How can the director know, given all that complexity, that after just one take of this shot he’s got exactly what he needs? I remember dozens of moments like that: no hesitation, no anxiety that something’s been missed or left undone. It’s galvanizing to witness such efficient, precise, and accurate decisiveness. Decision-making involves two levels of mostly subconscious cognitive work. The lower level models the situation itself: the larger context into which the decision and its consequences fits, some analogy with earlier experiences, and simulated outcomes. Here was Spielberg probably evaluating against a kind of mental storyboard: what the shot needs to show and how it needs to look, and how it’ll fit into the editing rhythm of the scene. The higher level models, well, the modeling process itself: how accurate does the lower-level model capture aspects of reality? Are they salient pieces of reality? And are there just enough of them to support high-quality decisions? I painfully recall trying to make certain crucial decisions early on as a leader through purely conscious, brute-force analysis (i.e. lower-level modeling alone). The panic and paralysis of feeling — incorrectly! — that there wasn’t enough information was excruciating. But it turns out that decision-making acumen — especially around upper level modeling — is susceptible to practice. With the upper level humming, even highly complex or consequential decisions generally feel sharp-edged. And when a decision feels hard, chances are it’s because there genuinely isn’t enough information. 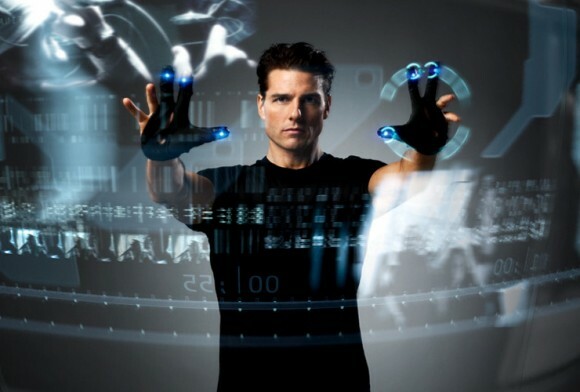 The scenes in Minority Report involving a room-scale visual computer, gesturally controlled by the Precrime cops in forensic pursuit of future murderers, were a major part of my work on the film. After months designing and refining that pseudo-fictional UI, I put together a user manual that described, in words and pictures, how to operate the gestural UI. This booklet failed to connect with the director, producers, and actor who were its audience. So with four weeks left until shooting I spent two making a rough live-action-plus-CG video showing what the UI would actually look like in use. We found a precious interval on-set in which Spielberg wasn’t immediately occupied. The intensity of his face as he watched the video was telling; when it finished he looked up and said “This is great. We can use it. Let’s show Tom.” And so we have the movie as we know it today. In that instant, he made the decision to commit deeply to the fictional UI. Its design hadn’t changed; the ‘training video’ theoretically showed the same thing as the printed training manual. But it was the video that was able to transmit critical context from one isolated mind to others effectively. The point, of course, is how singularly important shared context is. An organization can live or die on its ability to insure the same operating context in its people’s minds. Any serious company regards the communication mode(s) that enable context as a top priority. Try anything. Use everything. Little movies, lectures, storyboards, pamphlets, limericks: everything’s possible. Anything can work. No permissions required. The inside of a film production’s art department is an architecture of shared context. Nearly every wall surface is covered with visual information pertinent to the coherent design of the film’s world: reference imagery for texture, shape, color; detailed concept illustrations for props, costumes, architecture, furniture, vehicles, and cityscapes; physical models of entire sets. Stakeholders walking through that literalized memory palace walk through the film’s spatial and visual essence. We humans are visual creatures. Our brains love pictures. Pictures sing directly to one of the largest systems in the human brain. So every workflow and every process can benefit from visual treatment. It’s the single best way to establish, validate, and evolve the shared context that’s foundational to twenty-first century business. The approach also works at a scale of complexity larger than you can maintain in your mind otherwise: visual representation extends cognitive reach. Yet the enterprise effectively ignores this incredible opportunity. Minority Report is a deliberate statement on the topic. The movie shows a police team whose ridiculously urgent task is possible only because of the panoramic, collaborative, visually intensive digital environment they use to connect and amplify their own innate talents. A few years after the film was released, I formed a company to bring such tools to the real world: working this way will be universally transformative for businesses and organizations and endeavors of every ilk. A person who can see more understands more. When several people can see the same thing at the same time in the same way, they share understanding. When teams share extended context they can solve bigger and harder problems, make better decisions, and build better things. To see more is to do more.